How CoolSculpting works is important to know if you’re interested in getting the procedure to remove fat from your body. After all, everyone deserves to know what they’re signing up for. Well, if you’re interested in CoolSculpting, you should know that the procedure is safe and reliable when used in the right circumstances. Before getting into the procedure, it’s important to note that the whole idea around CoolSculpting is backed up by the science of how temperature interacts with fat cells. 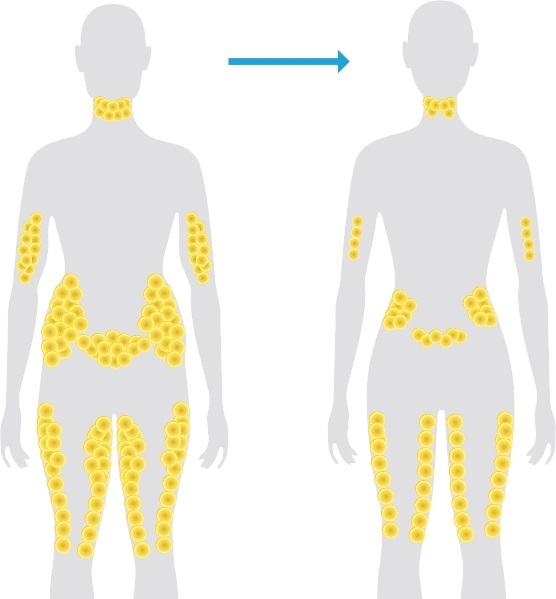 How does the science of CoolSculpting work? For a long time, it has been observed that exposing fat cells to very low temperatures is a way of decaying them. Fat cells are more sensitive to temperature than many other types of cells in your body—low temperatures has been observed to degrade fat cells in the cheeks of kids who eat many ice pops. The process in which cold temperatures kill fat cells is called cryolipolysis, while CoolSculpting takes that idea and creates an innovative method of reducing fat for body-shaping purposes. The FDA approved of CoolSculpting in 2010, and the new method of fat reduction became more and more popular as a safe way of reducing fat. Because CoolSculptingis a nonsurgical, non-invasive, and simple way of getting rid of fat, many people are confident that it’s a safe method of fat treatment. There have been over 100 peer-reviewed clinical studies on CoolSculpting, and the evidence shows that CoolSculpting is a viable method of fat reduction. Therefore, CoolSculpting is based off of proven science and many years of research, which means that it is a reliable procedure for fat reduction. How do I set up an appointment with a CoolSculpting clinician? Now, you may want to know how setting up a CoolSculpting procedure works. Well, to get started, the first step you need to do is to consult with a CoolSculpting provider. These people are certified professionals with specialized training in CoolSculpting, and they can easily be found by searching online. After meeting with a CoolSculpting clinician, your body will be given an inspection. Then, you and he will set goals about what you want out of the fat-reduction procedure, focusing on specific areas where you want your fat reduced. Then, the process can begin, and your clinician schedules a treatment plan for you. During the procedure, the trained professional uses well-designed machine to carry out fat removal in the specific areas prepared for treatment. Usually, the treatment plan will only consist of one session, which can range from 35 minutes to 2 hours based on how many different places you have targeted for fat removal. In some cases, your doctor will want to set up multiple sessions for CoolSculpting. In almost all cases, however, your doctor will want to have a follow-up appointment regardless of how many sessions you had, so expect to find room in your schedule for the follow-up appointments. Scheduling shouldn’t be much of an issue, and that’s how it works—it’s quick and simple. So, we know that CoolSculpting is based off of the scientific idea of cryolipolysis, and that it kills fat cells over time. However, how does the machine work to reduce temperatures in certain areas? A study that analyzed the temperature of the skin and fat during a 60-minute session of CoolSculptingshowed that the skin surface temperature drops steadily over the course of the procedure until it reaches an average temperature of 54 degrees Fahrenheit or 12.3 degrees Celsius. By reducing the skin to those temperatures, the machine can focus on certain areas in which it wants to kill fat cells. How does the fat removal process work? Another important thing to know is how the fat removal works with respect to your body. Typically, when you gain weight by eating fatty foods or junk, or when you lose weight with diet and exercise, weight is lost and gained in specific ratios throughout your body, evenly. However, when you decide on a CoolSculpting procedure, the fat is removed from particular parts of your body and not others. This is why it is great for removing excess fat, but not for losing a large quantity of weight. This is an important thing to note when deciding if CoolSculpting is right for you.CoolSculpting won’t help you lose a dramatic amount of weight if you are suffering from overweightness or obesity—it is intended to reduce the stubborn fat left behind in certain parts of your body, such as flab under the arms or excess weight on the thighs. All of it has to do with how the treatment process works to remove fat from your body. Something you might be wondering is how safe the procedure is, considering the fact that it involves machinery and conditions you are likely not used to. How is CoolSculpting kept a safe procedure? There are several key ways that the safety of CoolSculpting works to keep patients safe. First, the CoolSculpting procedure is always handled by clinicians who are specially trained in CoolSculpting. This leaves out the possibility that something will go wrong due to a lack of experience—the special training is an in depth certification to make sure that the process is done correctly and safely. Then, the treatment always takes place in medical offices and under the careful supervision of licensed professionals in CoolSculpting to guarantee the highest standards of care. CoolSculpting systems also have built-in safety measures to ensure that your skin is not harmed in the process. When the sensors detect that the skin is too cold, for example, the CoolSculpting system automatically shuts down. Many people feel confident that the CoolSculpting treatment is not only effective, but safe. Understanding how CoolSculpting works is a great thing to know if you are considering getting that kind of fat treatment. In this article, we have covered the scientific idea behind CoolSculpting, how the CoolSculpting machine was engineered to work and what temperatures it exposes your body to, how to schedule an appointment and how treatment plans work, how the safety-measures behind the CoolSculpting procedure work, and more. You should now be packed with a good understanding of how the whole entire process works—now you’re ready to assess whether the treatment is good for you!